I am excited to announce that I have designed this garden to highlight mental health awareness. The garden will be at the Harrogate Flower Show from 25-28 April and is proudly supporting Leeds Mind, the Leeds mental health charity which provides support and information when people need it most. I was inspired to create the garden after helping someone close to me through mental health issues and I wanted to show that there is light at the end of the tunnel - people can learn to manage their mental health with help and support. The garden reflects features of mental health suffering and recovery - from self-harm to counselling to help to manage the very real pain that those with these issues experience. Objects representing activities often chosen to combat mental health issues. 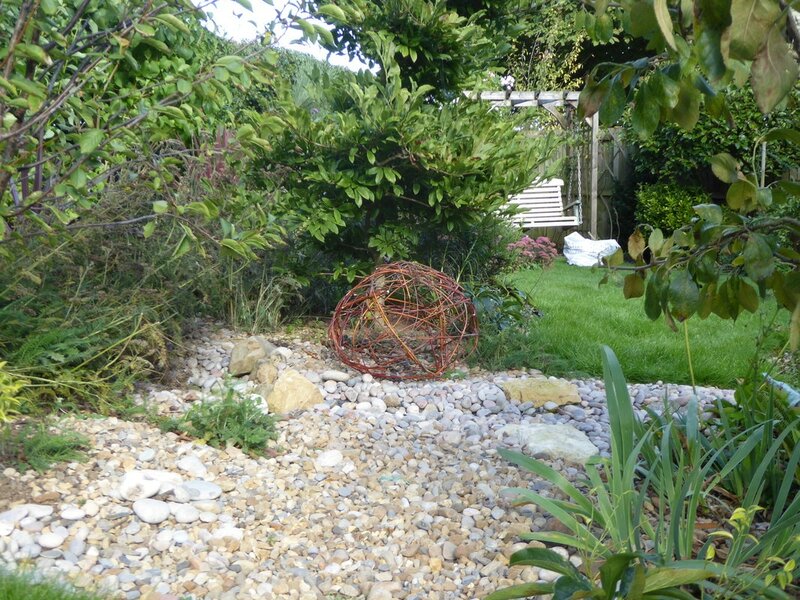 A polished stone spherical sculpture, provided by David Harber, will provide a strong focal point at the culmination of the journey around the garden, evidencing a new inner strength and positivity in dealing with mental health issues after adopting strategies developed through talking therapies and other forms of mental health support. What should I look for in a garden designer? Garden designers do not have to be qualified to practice garden design but they really should be! You should ask whether they have relevant qualifications and ask to see examples of their plans for other people. A good designer will be able to produce scaled plans - artistic ones and, where needed, detailed ones from which landscapers can build. I also produce 3D models of your garden on computer which you can look around as if it were already built, so you can really get a sense of how your garden will look. Is it going to add value to use a garden designer? A good garden designer will know how to help you understand what you really want from your garden and how to achieve it. They should also be able to help you avoid some costly mistakes. In short they should more than pay for themselves! Can gardens be designed in autumn/winter? Absolutely. This is a great time to design and plan your garden renovations. Landscapers are often booked up in advance so planning your design in winter leaves you at the front of the queue for spring builds. I am frequently contacted by people who are uncertain about whether I will be able to help them. The fact is that, if it concerns how you use your garden or what your garden looks like, I can probably help. No matter whether you have an empty building plot, are building an extension to your house or generally wanting to spruce up or completely redesign an existing garden, chances are I can help you with your outdoor space. What is the key to designing a beautiful front garden? 1. Where will you put your bins? 2. How much room do you need for the car to come in and turn or reverse out again? 3. Where are the services coming into and off the property? 4. 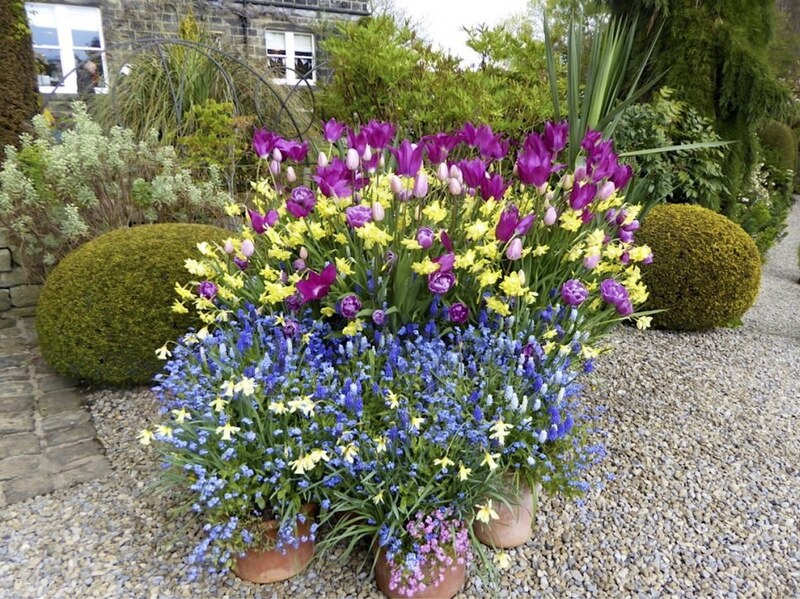 Do you want to screen your front garden or show it off? ​5. How will you light the entrance to your garden? Beyond the practical aspects, it's a matter of assessing an appropriate theme or concept for your garden around which to develop the design. Some people believe that front gardens should be formal and tidy. I think that's ok but too restrictive. 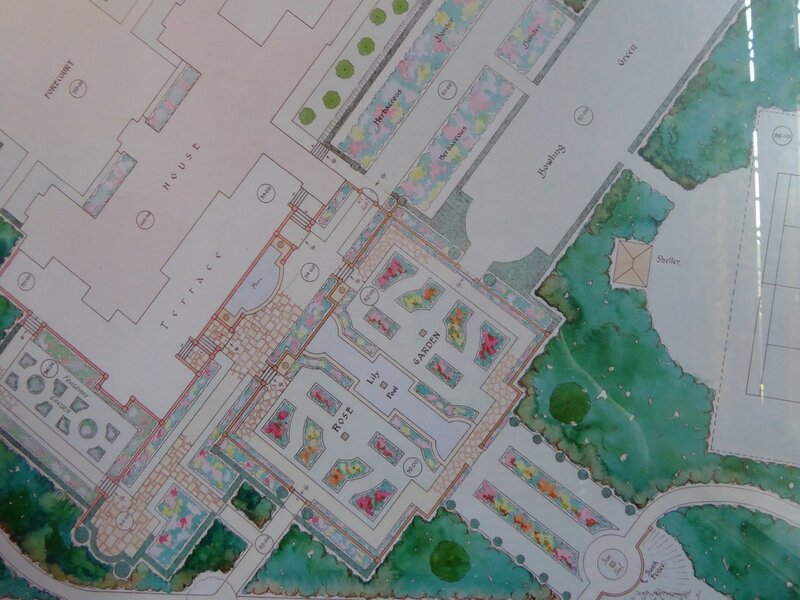 Yes, a formal garden could be just the thing to complement a Georgian style house but may look inappropriate in a more natural setting. A good design will take all these points on board as well as accommodating what you want to do in your front garden. I am busy with queries about garden redesigns and it's only January! It seems that people are realising that there is a relatively short window to get a garden designed and then booked into busy landscaper schedules for the year ahead. So people are getting organised and wanting their redesigns scheduled into the diary as soon as possible. This is very sensible. Landscapers are busy quoting and planning their year ahead and if you snooze you lose! Bare root plants are available from 1 November to the end of March only so there is also a only a limited time left to acquire these cheaper plants for bedding in during the dormant season. It might be freezing outside but now is the perfect time to plan your new garden and get booked in. Call me today to make it happen in 2018. I’ve been out and about this month enjoying wonderful wintry gardens resplendent in frost and vibrant festive colours. Two of the best to visit this time of year are Harlow Carr (Harrogate) and Fountains Abbey (Ripon). I visited the gardens at about 3pm which leaves time to explore them in both light and darkness. They both have stunning lighting effects showing how you can use lighting to pick out the beautiful shapes in your garden and extend its interest into winter. If you are wondering how to plant a garden for winter interest take a few clues from the winter walk at Harlow Carr. They have wonderful dogwoods in lots of eye catching colours but also other less obvious contenders like Hamamelis - spicily fragrant witch hazel. So if you are wondering how to work off the mince pies, take a brisk walk around one of these gardens and start planning your garden for 2018! Yes, it's that time again when we are wondering what to buy our loved ones. 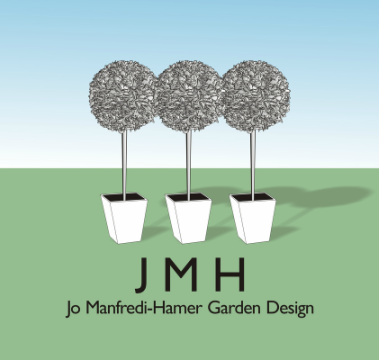 A voucher from Jo Manfredi-Hamer Garden Design could be just what you are looking for and here's why. In the fast paced world in which we live there never seem to be enough hours in the day to do everything and we are often too busy toiling in our gardens, weeding and pruning, to enjoy them. So we never realise the full potential of a place which could, given a little planning, be a haven of relaxation or that perfect place to enjoy a prosecco outside of an evening with friends. Jo Manfredi-Hamer can help you to enjoy your garden again and we offer some fabulously festive gift vouchers. This could be the perfect present for that hard to please relative or for the man/woman who already seems to have everything. For a limited time only we are offering consultation vouchers at very competitive rates. Winter is the ideal time to take stock of your garden and dream of summer so what are you waiting for? I have been really busy recently but I managed to squeeze in a day off today and visited Goddards House and Garden - the home of Terrys chocolatier Noel Terry. I was not disappointed and the visit highlighted a very important point. 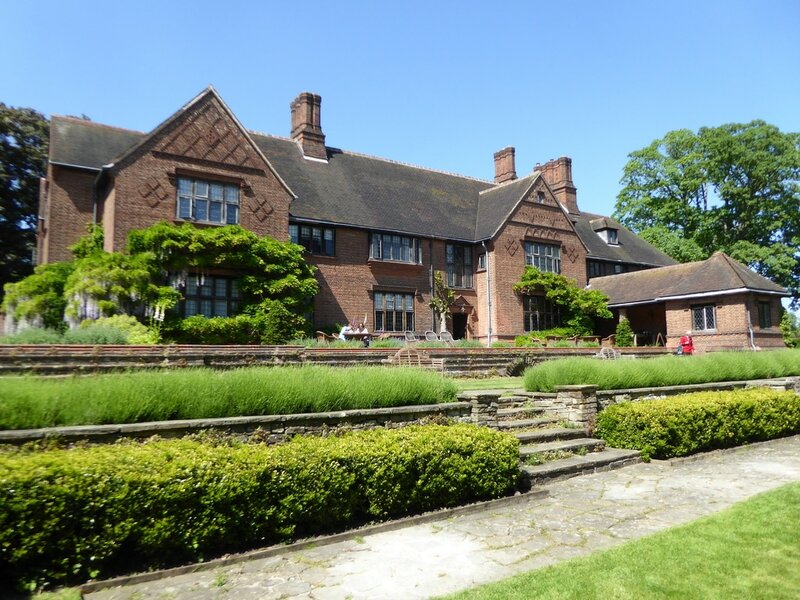 ​The home and garden are in perfect harmony with each other which is no accident as the garden designer, George Millstone, worked very closely with the architect, Walter Brierley to bring the arts and crafts style to life in this place. Garden designers understand that a garden should sit well in its setting and so the style of house is crucial to the style of the garden. So, very often garden designers will work alongside architects when new house builds are planned or even when a new conservatory or extension is planned. 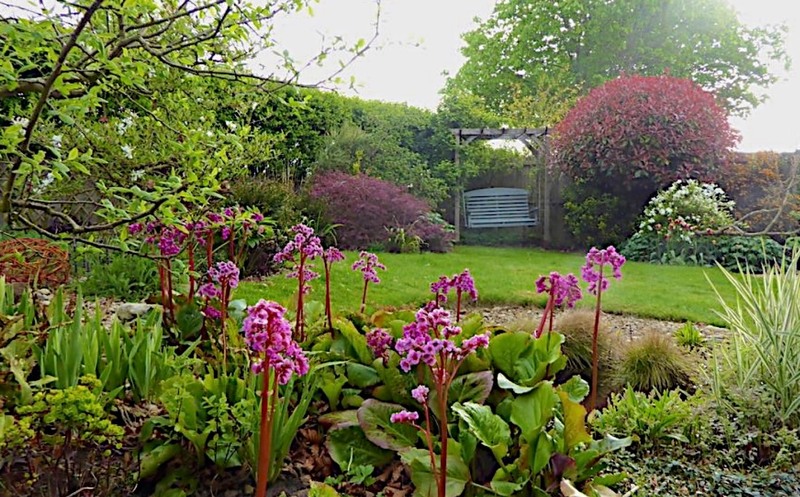 This makes perfect logical sense and, often, the garden designer can suggest the correct placement of doors and details in connection with build to make the most of the garden. When planning a change to your house, remember to think of the garden and bear in mind that Jo Manfredi-Hamer Garden Design is waiting to work with your architect! If you already have your extension, we can advise on how to redesign your garden to make the most of your space. Ever noticed how some gardens have good bone structure? By that I mean they have interesting high and low points for the eye to rest on. These gardens usually have good evergreen planting so that there is something to look at all year and sculpture as a focal point. I made the red willow 'egg' sculpture in the picture for my pond and every morning I can enjoy the view from my window of birds which come and perch on it whilst taking a rest. The willow is striking and seems to 'glow' as it catches the low Winter sun. 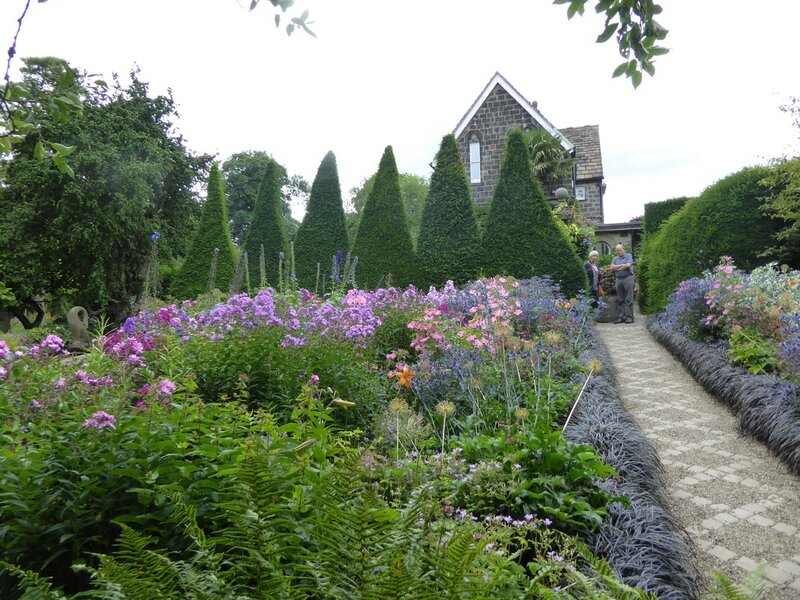 The garden on the right is York Gate in Adel - if you visit only one garden this year make it this gem. It is crammed with ideas for focal points and sculpture. And as the Winter weather arrives, try photographing your garden in snow. If it still looks interesting chances are it has good bone structure. If not, well you know where to come for advice.....! This month I am loving the fencing on this show garden by C & W Berry which won a gold medal. The great thing about this garden is that it is full of small landscaping details which, taken altogether, pack a real punch. Designers understand that, in contemporary spaces, the small details really count and are constantly on the lookout for ways to make fencing and paving fit the mood of the garden and elevate it from ordinary to extraordinary. Outdoor cooking areas are really big this year and there are some wonderful ideas for making bespoke areas just perfect for your space. When I am not designing gardens, I am visiting flower shows and horticultural events to bring you the latest developments!